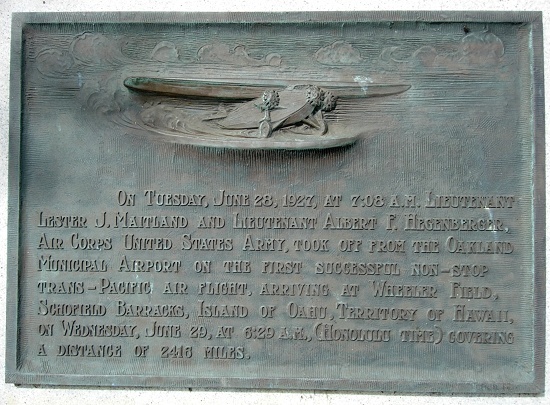 The Metropolitan Oakland International Airport has a distinguished record in the annals of flight, from Amelia Earhart to the pioneering exploits of Lester Maitland and Albert Hegenberger, all of whom have Oakland streets named for them. Starting in the late 1920s, pilots at OAK launched and landed their planes on Runway 27, now part of the airport's North Field. Passenger jets landed on mighty Runway 29, almost two miles long. But this October, that changed. Runway 27 was forced by the authorities to become Runway 28, Runway 29 became Runway 30, and a long tradition was ruptured—or was it? Airport runway numbers are not arbitrary, like street names. They actually designate the runway's direction. The system is simple: take your magnetic compass direction (in degrees from zero to 360), round off to the nearest 10 and drop the zero. 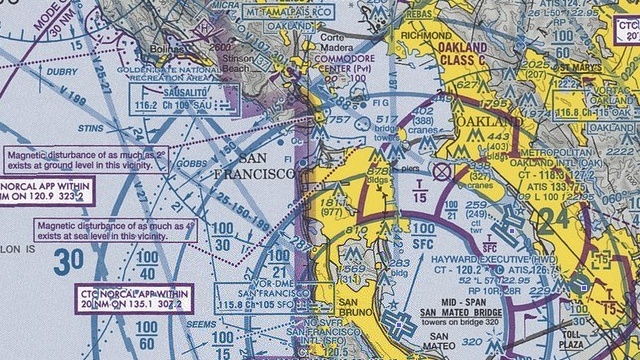 Pilots can see the runway's designation right on their own aircraft compasses. Magnetic navigation is the most conservative, failproof method there is because the magnetic field is generated by the planet itself. When satellites fail, the ground is shrouded in fog or snow, windshields are smeared, the stars and moon are obscured and worse, the compass is constant...sort of. The Earth's magnetic field arises from its own substance as the huge body of molten iron in its core stirs with the Earth's rotation and the moon's steadying hand. Electrical currents in the iron generate magnetic fields that struggle against the stirring, acting like a natural turbine and powering the magnetism that draws our compass needles to attention. This sounds busy, and it is. The geomagnetic poles, north and south, are always wandering and must be closely monitored by a network of observatories to keep navigation accurate. That's how the authorities knew when to change Runways 27 and 29 to 28 and 30. The difference between magnetic north and true north is important to serious off-road travelers: hikers, wilderness explorers, sailors and airline pilots. The early aeronauts were exceptionally dependent on their compasses, like Earhart and the other heroes of the Oakland airfield. Imagine lifting off from Oakland, turning left and heading out over the open Pacific at a hundred miles an hour to fly to Hawaii, all by yourself. I don't know about you, but it makes me shiver. But as they flew, the magnetic field kept them steadily on course, even though the field itself is unsteady in the longer term. Now put yourself in the mindset of geologic time: a thousand years is like a moment, a million years like a minute. At that speed, the magnetic poles and their motions turn into a flicker, a blur, a cloud of activity centered at the true north pole. The magnetic field is steady again. Geologists use the iron-bearing minerals of rocks to determine the magnetic poles of the deep past. They take a lot of samples and average out the measurements, arriving at a paleo-magnetic pole. That might seem like a lot of work, and it is, but it has taught us an amazing thing. Young rocks—just a few million years old, you understand—point to a paleopole that's the same as today's. But in older rocks, as we go back in time the paleopole steadily veers away from north. The very continents themselves are moving around, as surely as airliners. Once this fact was accepted, in the 1950s, we were moved inexorably to the modern theory of plate tectonics, and geologists had one more thing to give them that faraway look.